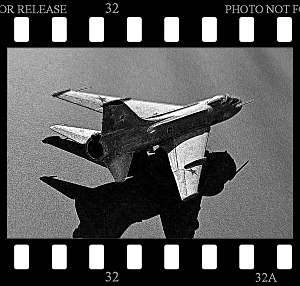 Soviet Tactical Aviation “Frontovaya Aviatsiya”, 1967. 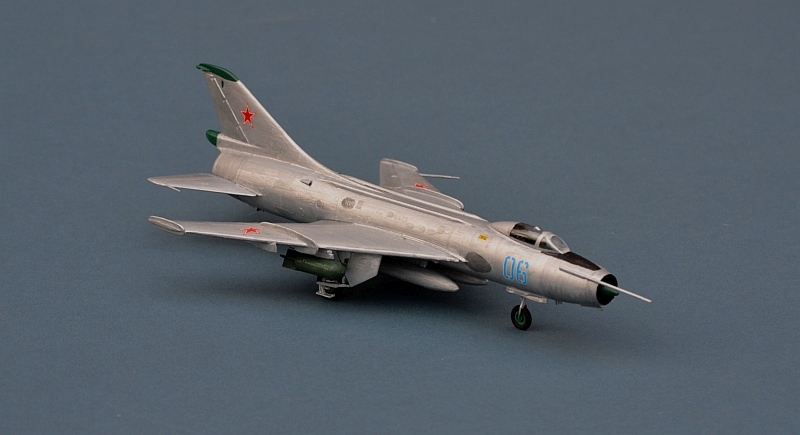 During the Cold War, it was often difficult to obtain accurate details (and thus kits) of Warsaw Pact aircraft and equipment. Czech company KP were one of the few reliable sources, and although their kits were often rather roughly moulded and difficult to build with barely usable decals, they quickly gained a reputation for accuracy. KP’s main business was moulding kitchen utensils, and as the Iron Curtain began to drop they quickly upped their game to become one of the first of the new wave of eastern european kits that set such high standards in the late 1990s. This particular kit is a late 1980s issue, (the instructions suggest 1987) and kind of straddles this period - it still uses a very low grade polystyrene that is hard and brittle, with resulting consequences for the fit and detail possible on the kit, but it starts to show a more modern approach and layout to the sprue, with a reasonable attempt at a cockpit, sharp nose-cone edges and jet pipe assembly. 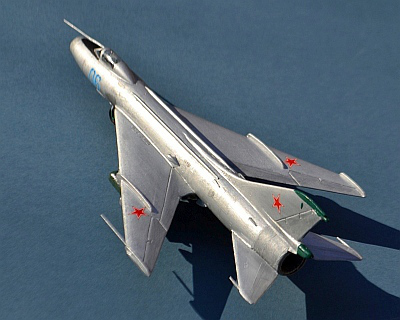 The Su-7 FITTER A started life in the late 1950s as a Fighter, but was quickly converted to the ground attack and strike role as the MiG-21 proved cheaper and more effective as a fighter. 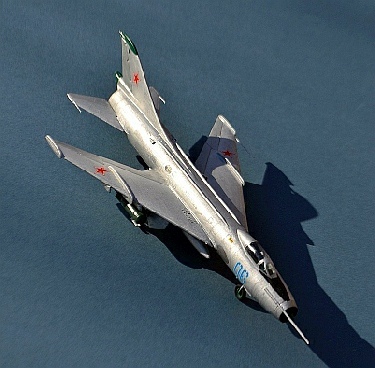 In this new role, after modifications and strengthening to enable high speed operation at low altitude, the Su-7 proved capable and rugged, becoming the mainstay of Soviet tactical aviation during the 1960s and 1970s, serving in front line units right into the mid 1980s. 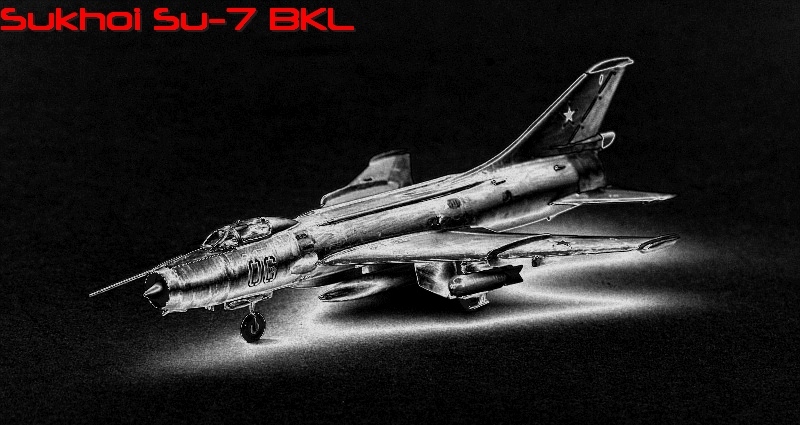 Like many high-speed aircraft of that time, it suffered from very poor range and required a very long runway for take-off and landing, leading Sukhoi to develop a swing-wing variant, theSu-17/22 to try and overcome this shortfall. FITTERs were widely exported to Soviet client states, and it is likely that some still remain in service with countries such as North Korea. The BKL version depicted by this kit employed a unique skid arrangement alongside its main wheels to assist with operation on soft unprepared runways or in snow, along with a larger nose wheel and twin braking parachutes. Rocket JATO pods were then utilised to assist with subsequent take-off, making for a spectacular sight ! The kit was a reasonable build, but joints and edges needed a lot of cleaning up and the plastic responded a little slowly to my normal solvent-based liquid glue, although Revell Contaca worked well. The decals (a generic set of Soviet, Czech and Polish markings and numbers) were probably usable, but had yellowed badly and needed cutting individually from the sheet, so I used a spare set of ex Italeri ones instead. The canopy was also rather rough, but responded reasonably to a dip in Klear floor polish.